I think one of the most common mistakes in doing genealogical work is mixing up the records for people who have the same name. In Granville County in the 1700s, there were at least four men with the name “Sherwood Harris”. 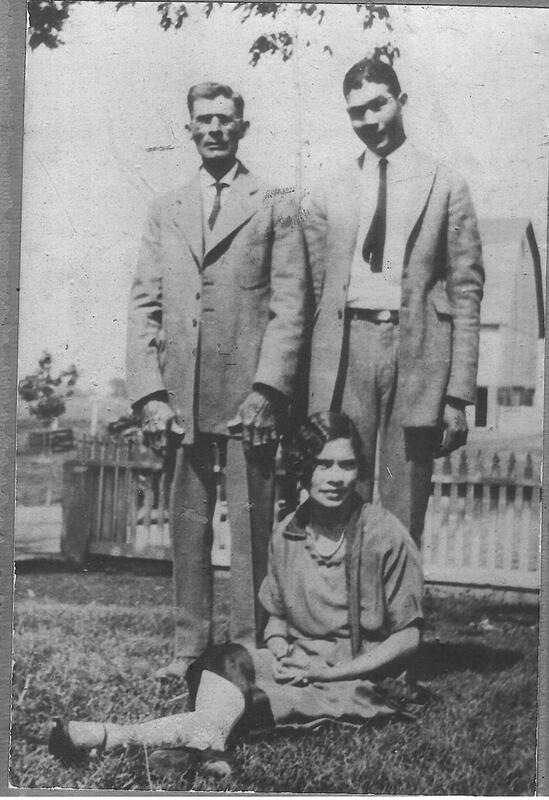 One of those men was my 5th great-grandfather Sherwood Harris. The three other men are related to one another but are unrelated to my Sherwood Harris. My Sherwood was Native American, most often listed as a “free person of color” in the records. The other three Sherwood’s were listed as “white”. One would think that this racial distinction along with many diverging life details would help resolve any confusion, but that has not been the case. In this blog post, I’m going to discuss the Revolutionary War pension application of my Sherwood Harris that has quite frequently been attributed to the other Sherwood Harrises. Hopefully this will be a helpful warning to other researchers to take more care in how they attribute records. My 5th great-grandfather Sherwood Harris (1761-1833) was the son of Edward Harris and Sarah Chavis. 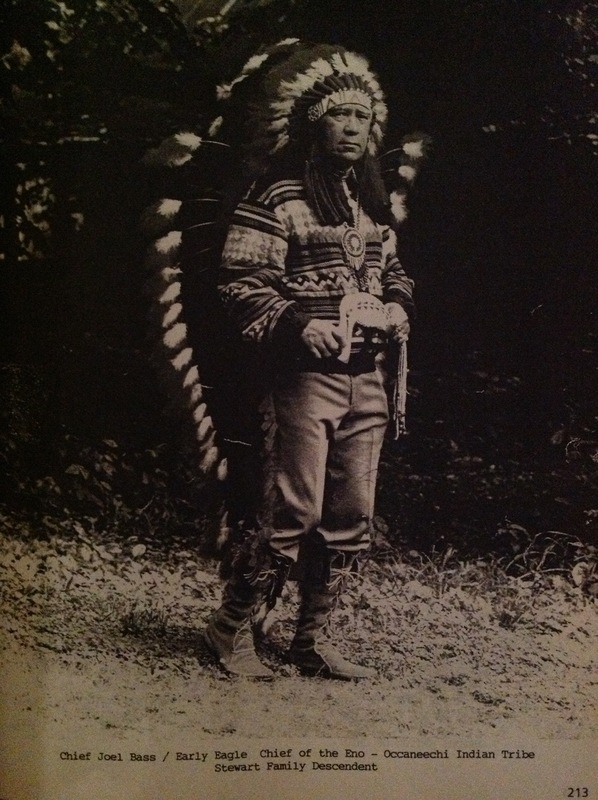 Edward Harris was among the founding members of the Native community in Granville. 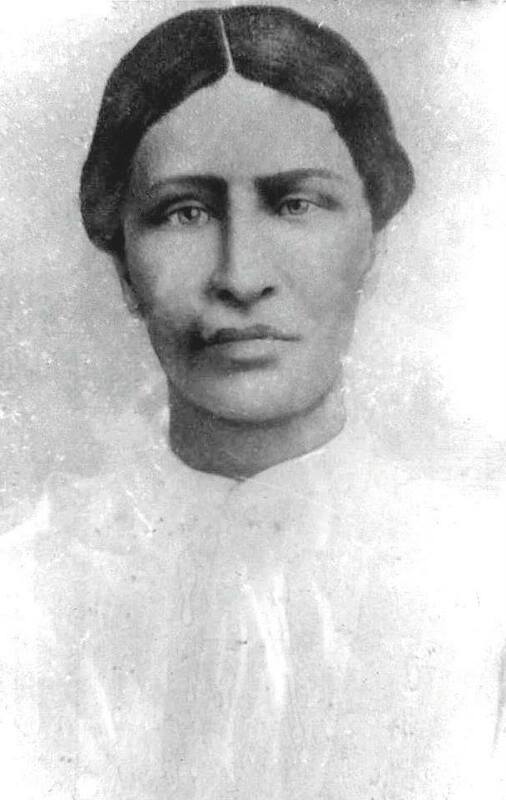 Sarah Chavis’ parents were William Chavis and Frances Gibson, who owned the original land base for the community. Two of Sherwood brother’s named Jesse Harris (1762-1844) and Edward Harris Jr (1756-1792) also fought in the Revolutionary War. Edward Jr died before filing a pension and left no heirs, and Jesse and later his widow Julia (Taborn) Harris successfully filed and received a pension (W.1277). It is actually incorrect for me to say that Sherwood Harris filed a pension. From after his service in the war and until his death in 1833, Sherwood never filed for a pension. According to witness testimony provided by Nathaniel Estes, Sherwood “felt rather above begging” the government for compensation. However after his passing, his widow Martha/Patsy Harris (maiden name not known) was in financial trouble and had no means of support. So in 1843, she filed a widow’s pension, application number W.3984. 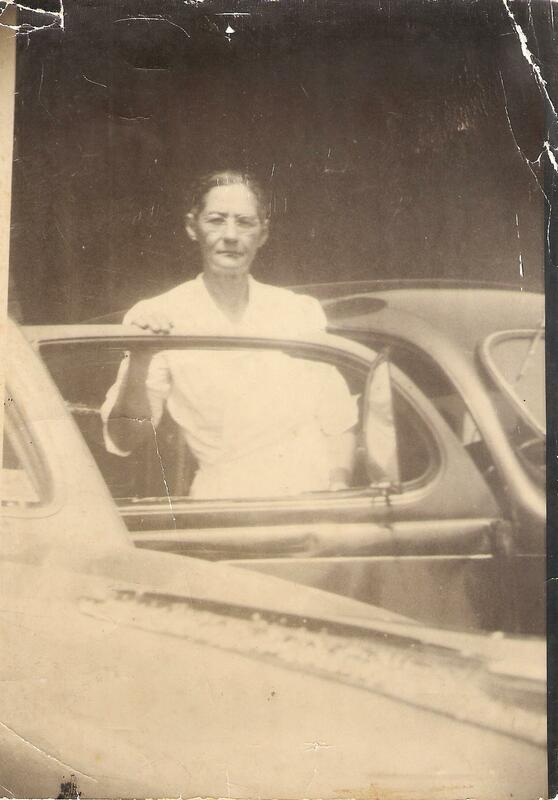 In order to receive a widow’s pension, Martha Harris had several things to prove. For one, she had to prove that she was legally married to Sherwood Harris and had not remarried after his death. She also needed to give proof of his Revolutionary War service including details such as names of captains and battles that would substantiate his record as a soldier. Despite both Martha and her deceased husband Sherwood being illiterate and not being able to leave behind a paper trail, Martha was able to prove her claim to a widow’s pension based off of witness testimony. 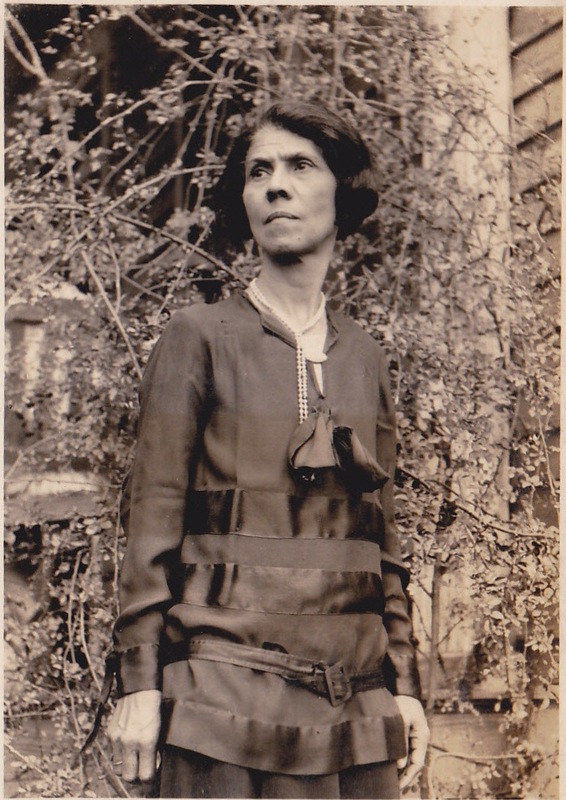 The following individuals provided testimony in support of Martha’s application: Frances “Fanny” Cavender, Samuel Chapell, Nathaniel Estes, Peter Cash, Stephen Bridges, and George Pettiford. I have a full un-transcribed copy of the pension application but you can access transcribed portions of the pension application here. George Pettiford (1760-1853) was from the Native American Pettiford family of Granville, and he was the son of founding community member Lawrence Pettiford. George was also a pensioned Revolutionary War veteran and provided testimony that he was well acquainted with Sherwood Harris before the war. He knew that Sherwood had been enlisted, but did not see Sherwood until after the war when they both came back to Granville. The five remaining testimonies came from white residents of Granville who also knew Sherwood Harris. Samuel Chapell (1757-1845), was a pensioned Revolutionary War veteran who knew Sherwood Harris around the time of the war and believed that Sherwood was a private in Col. William Moore’s regiment for at least two years. Peter Cash (1756-1846) was also a pensioned Revolutionary War veteran and recalled that he served with Sherwood Harris in Col. William Moore’s regiment. He further stated that Sherwood served under a different captain named Capt. Harrison. Siblings Stephen Bridges (born 1770) and Frances “Fanny” (Bridges) Cavender (born 1765) were personal friends of Sherwood and Martha Harris and knew that their father and older brother served with Sherwood in the Revolutionary War. They both remembered attending Sherwood and Martha’s wedding and provided 1787 as the approximate year of the marriage. And finally Nathaniel Estes (1770-1845) was aclose friend of Sherwood and Martha’s and provided some interesting information about the couple. He said he frequented their home regularly and heard Sherwood speak of being a soldier in the war. He also recalled Sherwood and Martha’s wedding but could not remember the date. However he added that Sherwood had a son who was older than his own son born in 1793 and that this son of Sherwood’s was buried on his property. The testimony provided by fellow soldiers as well as personal friends, allowed for Martha Harris to receive an annual widow’s pension payment of $80. However Martha Harris was not receiving any money because her pension payments were being illegally withheld by local land agent J.H. Kirkham according to additional testimony from Martha Harris in 1851 and backed up by a letter sent from her attorney William Hunt. As a result Martha was in a state of destitution. Letter from Martha Harris’ attorney William Hunt in 1851 confirming that she has not received her pension payment because it is being illegally withheld. 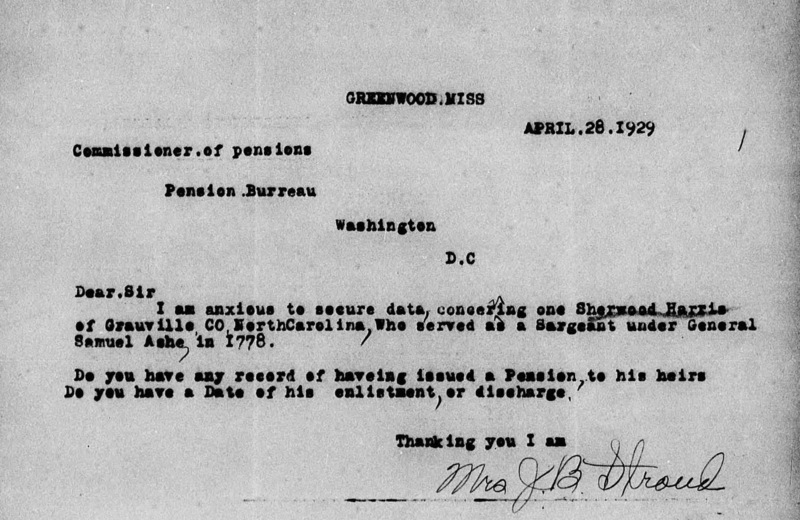 Even back in 1844, after initially filing the pension claim, the pension office mixed up Martha’s husband Sherwood Harris with another Sherwood Harris. The other Sherwood Harris had received a bounty land grant for 228 acres and Justice of the Peace Clement Wilkins writing on Martha’s behalf had to explain that it was a different Sherwood Harris who received this land. Justice of the Peace Clement Wilkins explaining the Sherwood Harris mix up back in 1844. “The Sherwood Harris who received 228 acres of land for two and a half years of service since in the Continental Line from the state of North Carolina could not have been her husband such since being entirely inconsistent that said forth in her own declaration”. As you can see, these Sherwood Harrises have been getting mixed up for quite some time. Finally in 1855, Martha Harris applied for a bounty land grant however there is no further documentation to find out what happened with that application. 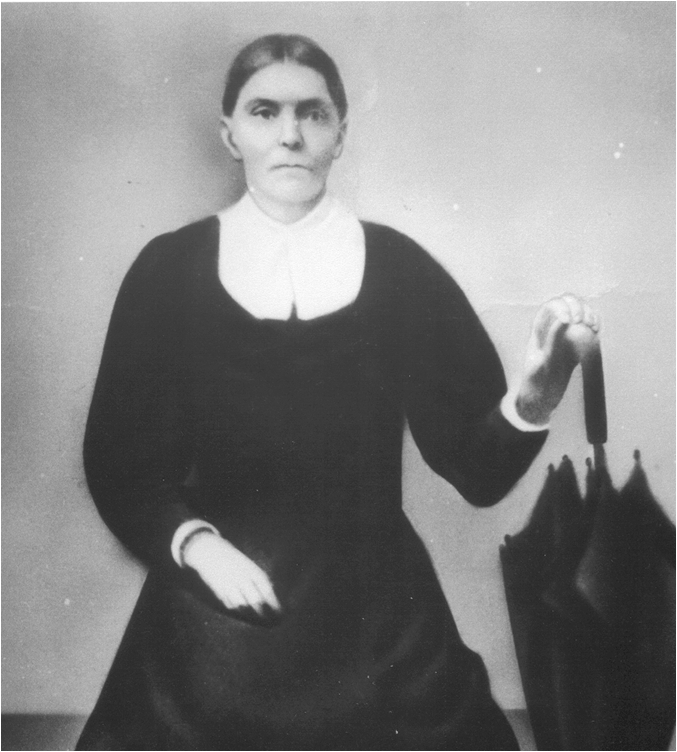 According to her 1855 testimony, Martha Harris was receiving $80 annually so it appears J.H. Kirkham eventually released her payments or she was issued a new payment certificate. Martha passed away in 1859. Martha “Patsy” Harris’ household in the 1850 census for Granville County. She had been widowed for 17 years and is living with her daughter and grandchildren. Delia Harris (1843 – after 1870), granddaughter of Sherwood and Martha Harris. 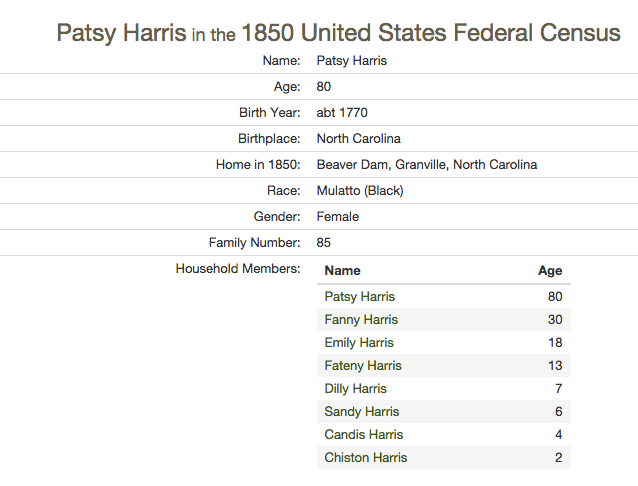 She is in Martha’s household in the 1850 census for Granville County, listed as “Dilly Harris” age 7. Her descendants today are part of the Haliwa-Saponi tribe. So who are these other Sherwood Harrises? Family Tree showing the Sherwood Harrises. Circled is the Sherwood Harris (1733-1805) who was also a Revolutionary War veteran as well as a Justice of the Peace. Most of the genealogical information on the Sherwood Harris family tree above comes from this website. I found many trees on Ancestry that included these Sherwood Harrises, though far too many looked incorrect, had contradictory information and lacked sources. 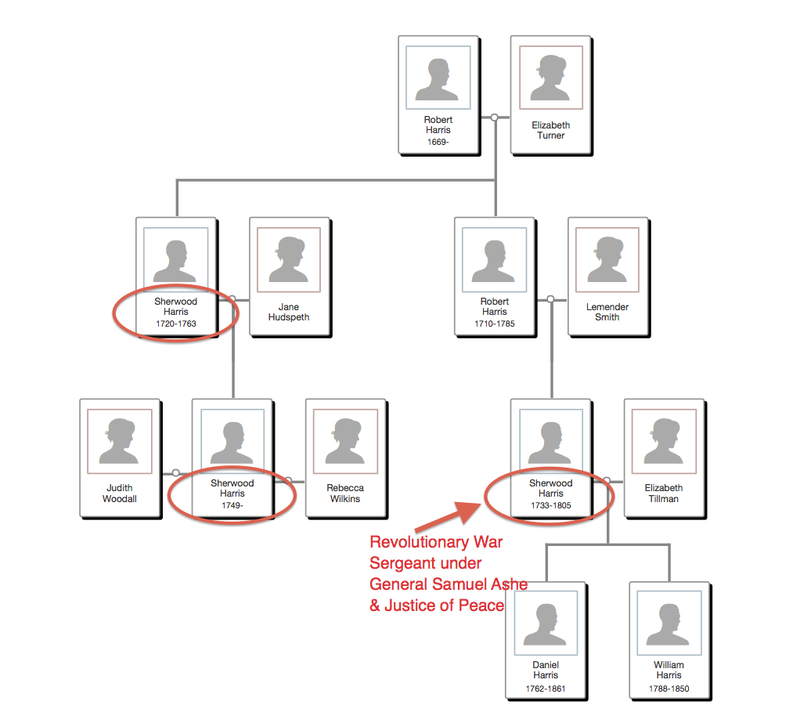 Many of these family trees also had the pension application for my Sherwood Harris attached to these three other Sherwood Harrises. What a mess! But by reviewing some additional records I was able to sort out the records for each of these Sherwoods and determine which of these other Sherwoods was also a Revolutionary War veteran. Off the bat, I could eliminate the Sherwood Harris (1720-1763) who left a 1763 will because he pre-deceased the Revolutionary War. Several descendants of the other Sherwood Harris (1733-1805) who was also a veteran, filed applications to join Sons of the American Revolution. 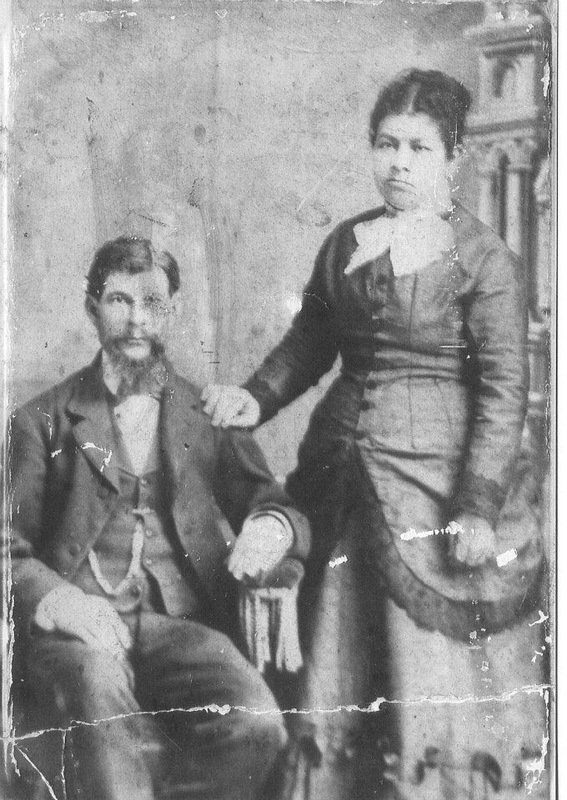 According to those applications, their ancestor Sherwood Harris was married to an Elizabeth Tillman/Tallman and they claimed descent through two of their sons – Daniel and William Harris. Additionally, they state that their Sherwood Harris fought under General Ashe and was also a Justice of the Peace. They also have 1805 as Sherwood’s death date. 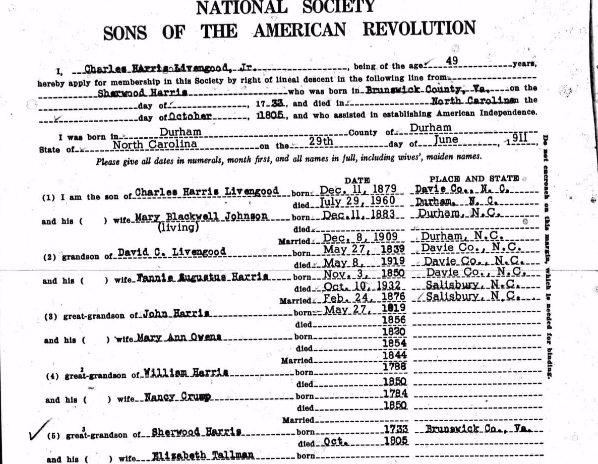 Sons of the American Revolution application for Sherwood Harris (1733-1805) descendant Charles Harris Livingood Jr. The document provides key details about this Sherwood Harris’ life and descendants. Source: Sons of the American Revolution Membership Applications, 1889-1970. Louisville, Kentucky: National Society of the Sons of the American Revolution. Microfilm, 508 rolls. More information on Sherwood Harris (1733-1805) confirming his occupation as Justice of the Peace from the Sons of the American Revolution application. The 1805 death date of the veteran Sherwood Harris is consistent with the Granville County census records which show 2 white Sherwood Harris head of households for the 1800 census, and only 1 white Sherwood Harris head of household for the 1810 census. So for any researchers of this family, the white Sherwood Harris in the 1810 census is the Sherwood Harris (born 1749) who was NOT the Revolutionary War veteran, and instead was the son of Sherwood Harris Sr. and Jane Hudspeth. Revisiting the pension application of my Sherwood Harris (1761-1833), it is clear the Pension Office incorrectly filed correspondence letters from the descendants of the other Sherwood Harris (1733-1805) veteran into his folder. The letters from these descendants provide details that are consistent with the other Sherwood Harris. Yet, the Pension Office wrote back to these descendants and provided them with the service information of my Sherwood Harris. Letter from a Mrs. J.B. Stroud, a descendant of Sherwood Harris (1733-1805) requesting information about her ancestor. 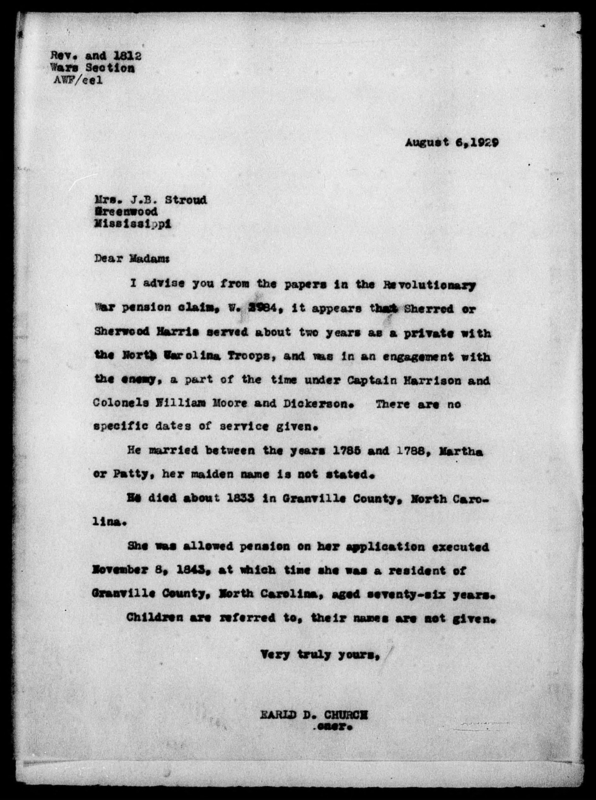 Response from the Pension Office to Mrs. J.B.Stroud, a descendant of Sherwood Harris (1733-1805). The office mistakenly gives her the service record and pension information on my Sherwood Harris (1761-1833). 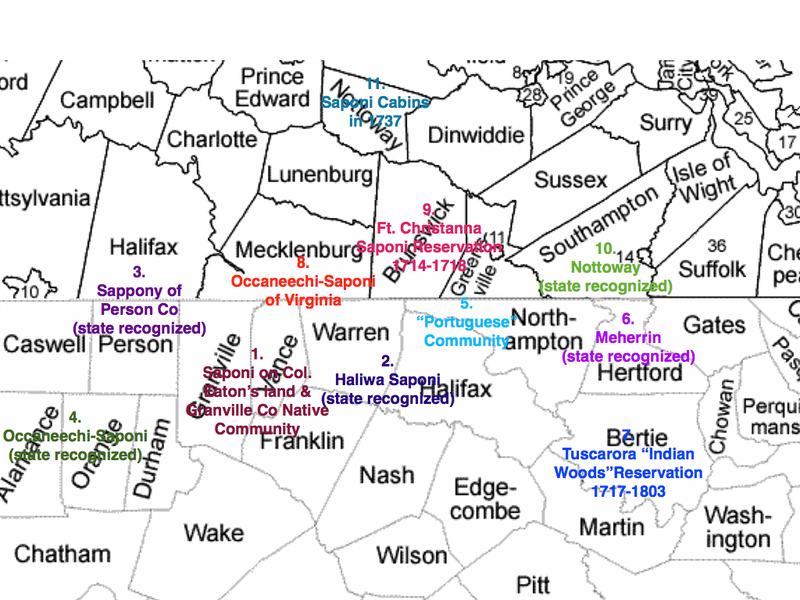 I hope this blog post will not only clear up any confusion about the many Sherwood Harrises of Granville County, but also serve as a reminder for all of us researchers to be patient and take the time to efficiently sort out and attribute records. In this post, I’m going to discuss the geography of Granville County that will help illustrate the settlement of the Native American community. 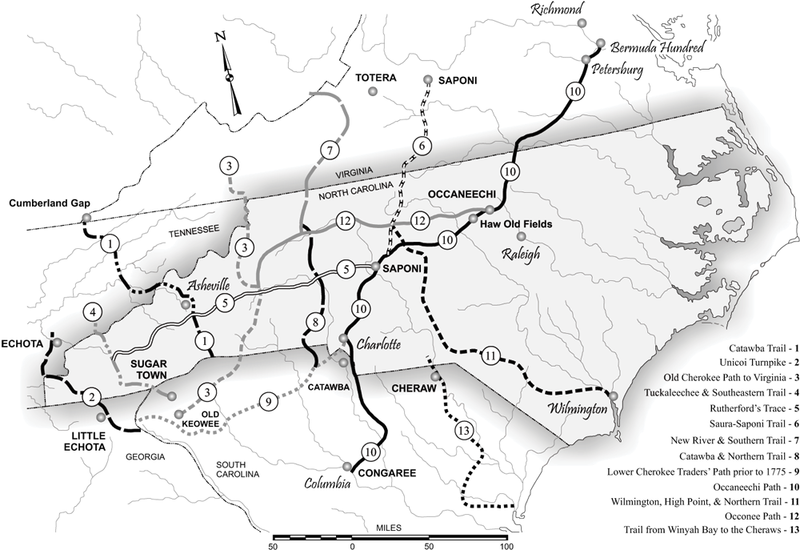 The Great Trading Path also known as the Occaneechi Path was a Native American road that began in Petersburg, VA and on some accounts ended with the Catawba Nation on the South Carolina/North Carolina border just below Charlotte and in other accounts, terminated in Augusta, GA. In the area surrounding Petersburg, lived numerous Indian traders and this path gave them direct trading access to tribes. The Great Trading Path cuts right through Granville County, entering Northeast from neighboring Mecklenburg Co, VA and exiting through the Southwest to neighboring Durham County. Not only was it beneficial for Indian traders to live on the path, but it was also necessary for tribes to live close to or have access to this path. 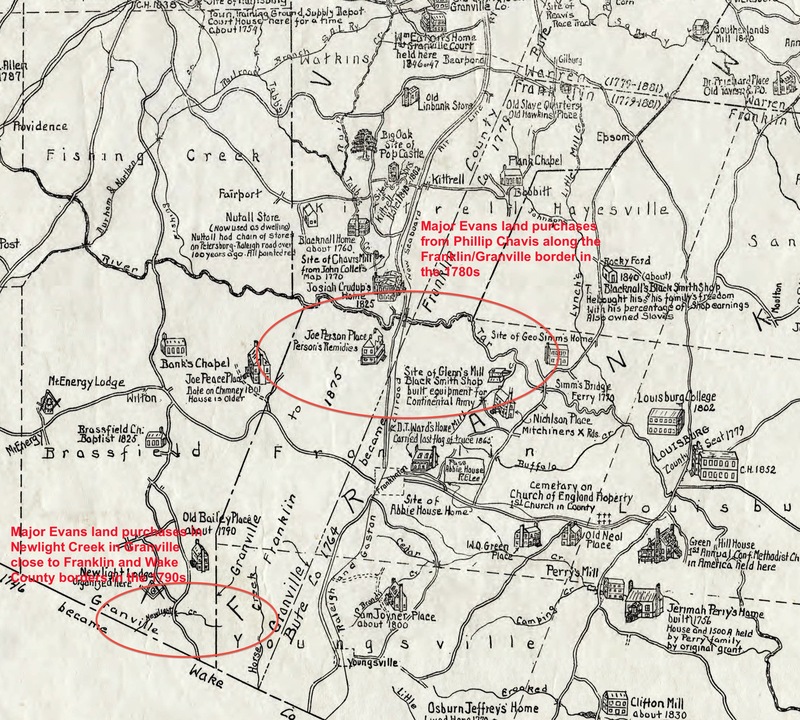 Col. William Eaton (1690-1759) who I have mentioned in previous blog posts was an Indian trader from Prince George Co, VA who moved to Granville County by the 1740s. Both of Eaton’s residences were along the Great Trading Path and it explains why a group of Saponi Indians were living next to his land in Granville in the 1750s. This means the origins of the Native American community in Granville are very much tied into this trade relationship between the colonists and local tribes and it explains why that specific location became the land base for the community. The path labeled number 10 on this map is the Great Trading Path. Another map of the Great Trading Path that includes county borders. You can see how the path enters and exits Granville County. Granville County was originally created in 1746 from Edgecombe County. Previously, the entire northern half is what was then the Carolina Colony was claimed by John Cateret, 2nd Earl Granville (1690-1763) and became known as Granville District. Map showing the upper half of the Carolina Colony known as Granville District. Originally, “Old” Granville County included the land that is today known as Granville, Vance, Warren, and Franklin Counties. This changed in 1764, when the areas known today as Warren and Franklin Counties were split from Granville to form Bute County (a short lived County, that quickly split into modern Warren and Franklin Counties in 1779). Finally in 1881, the eastern section of Granville that included the Kittrell, Henderson, and Townesville/Nutbush townships was separated to form newly created Vance County. 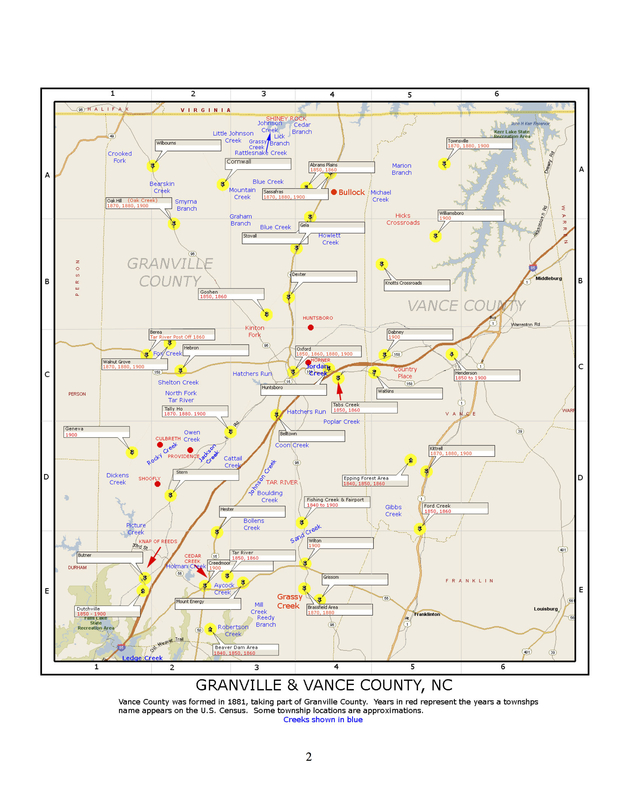 Map of “Old” Granville County which includes the modern counties of Vance, Warren, and Franklin. Dates along the modern county borders in the map explain the divisions. 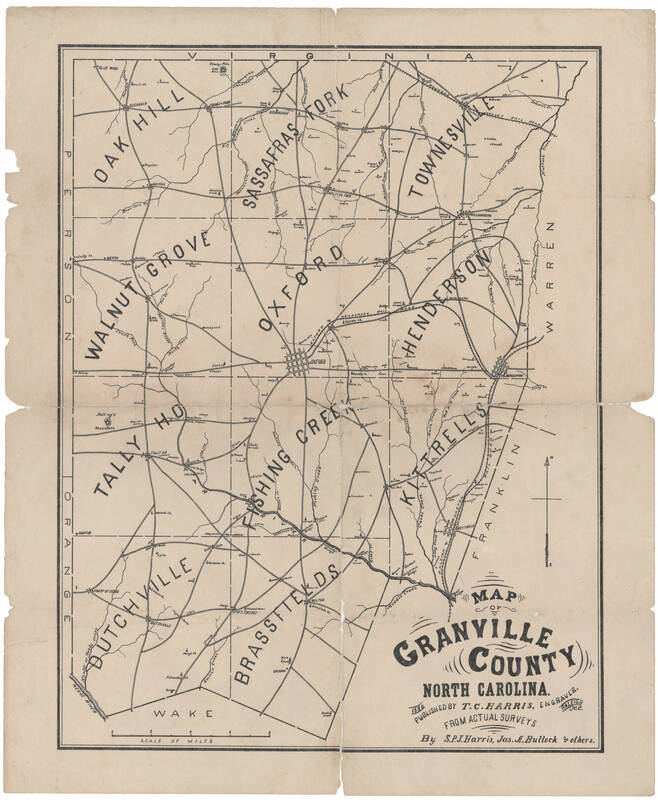 Map of Granville County in 1880, just one year before Kittrell, Henderson, and Townesville were separated to form Vance County. 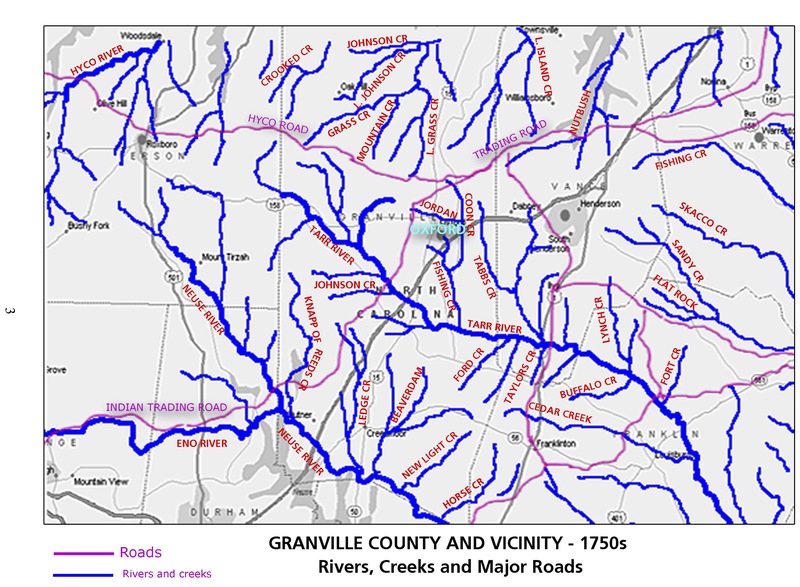 In addition to old Indian Trading Paths, being familiar with the local rivers and creeks is vital to understanding Native peoples’ relationship to Granville County’s geography. The Tar River cuts right through the middle of the county, the Neuse River forms the southern border of the county, and the Roanake River just barely touches Granville County’s northern border with Mecklenburg County. The Tar, Neuse, and Roanake are major waterways that local Natives have used since before European colonization. 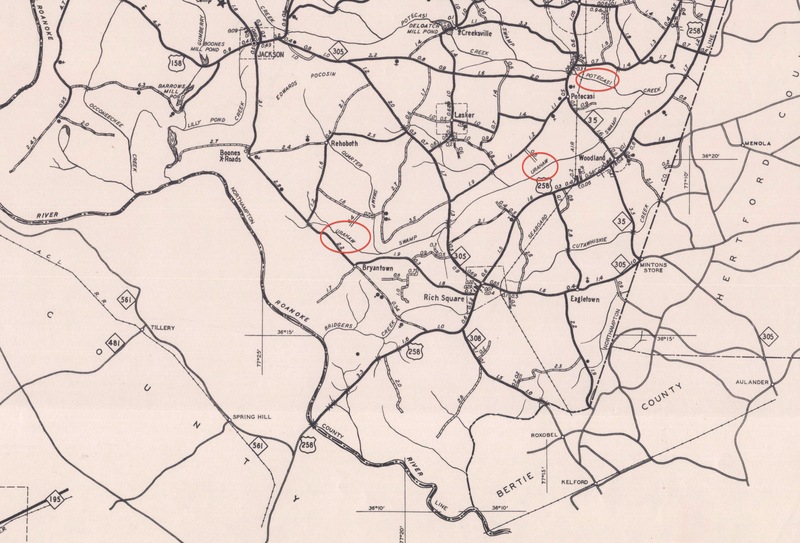 This blog post takes a closer look at the indigenous place names local to Granville County. The land base for the Native American community in Granville, is mostly concentrated off of Fishing Creek and Tabbs Creek which run north off of the Tar River. Founding community member William Chavis (1706-1778), originally owned a continuous land tract that stretched all the way from Lynch Creek to Fishing Creek along the Tar River and went 5 miles north inland. In this map, you can see The Great Trading Path labeled “Trading Road”. Buffalo once inhabited in this region, and “Buffalo Creek” off of the Tar River along with many other local buffalo name places, reflect this history. The buffalo is also what originally brought the Eastern Siouan speaking Saponi from the Ohio River valley into this region. When reviewing census data for Granville County, it’s helpful to know exactly what section of the county you are looking at. 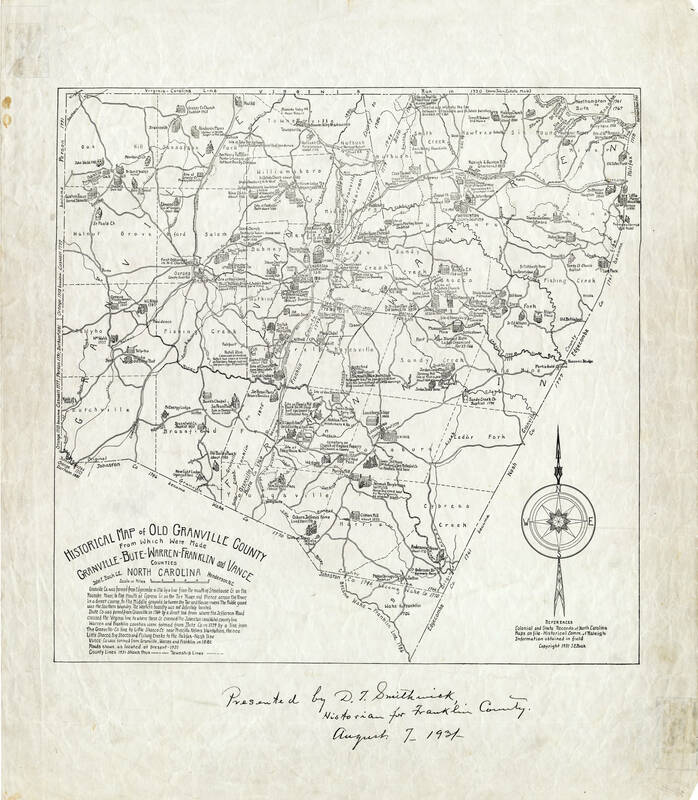 The following map displays the census designated areas of Granville County. Also note in northwestern Granville in the township of Oak Hill, is “Bearskin Creek” named after Saponi guide Ned Bearskin who accompanied William Byrd II on the Diving Line in 1728. Finally, I made a map of Northeastern North Carolina and Southside Virginia showing current Native American communities, former reservation land, and other important sites. The very close proximity of the sites to one another and to the Native American community in Granville County, demonstrate the interconnectedness of indigenous peoples living in this region. Please note that this map does not reflect all past or current Native American sites but rather shows locations that are most relevant to Granville’s Native Americans. The Native American community in Granville County was very much a community, and not a place where unconnected random Native American peoples settled. It was/is very much a thriving, connected community of very closely related families that have been intermarrying with one another in this exact location since at least the early/mid 1700s. 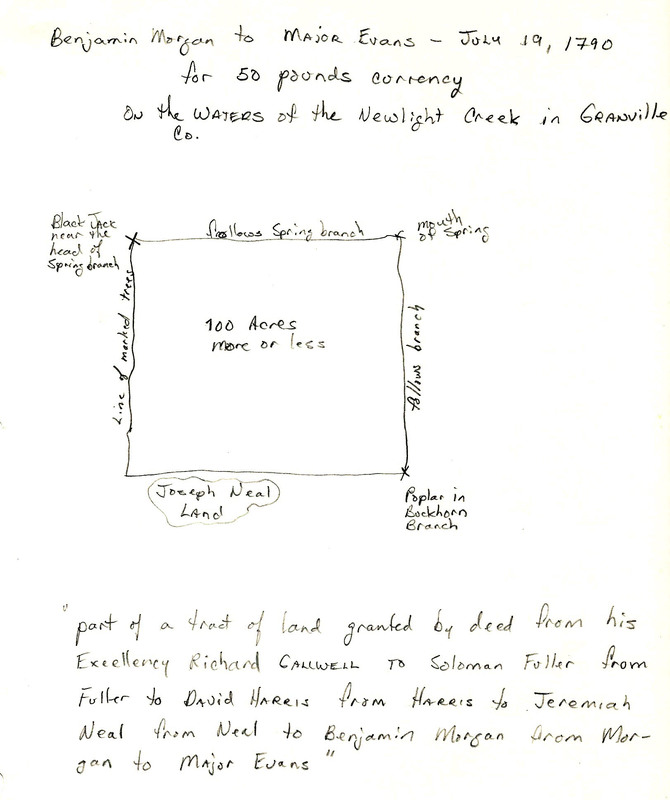 There is probably no better way to demonstrate this, than to identify the group of Saponi Indians that were documented living in Granville County next to Col William Eaton. In the previous blog post, I listed several sources from the mid 1700s that placed a group of Saponi families living next to Eaton. It is from this group of original settlers that the Native community in Granville traces its roots to. But who exactly were these early families and how can we identify them? there were approximately 14-20 “fighting men” meaning healthy adult males and there was an equal number of women and children. By examining the list of Eaton’s regiment, tax lists, and land deeds I was able to come up with a list of men who perhaps were the Saponi listed in Eaton’s regiment. Unless noted otherwise, all the men that I researched were “free people of color” a term applied to all free non-whites living in the Southeast including Native Americans. 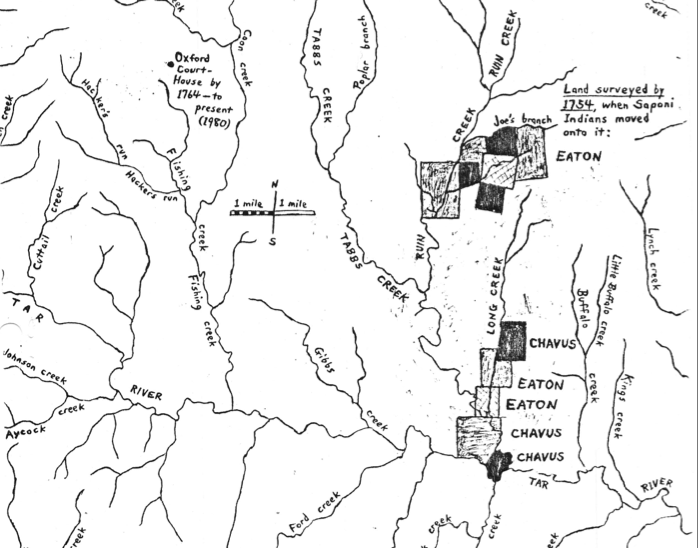 Researcher Roberta Estes of the Native Heritage Project previously blogged about Eaton’s regiment and made an attempt to identify the Saponi Indians living in Granville. A 1761 report counted 20 Saponi warriors in the area of Granville County, NC and this corresponds to the “Mulatto, Mustee or Indian” taxation in Granville of such families as Anderson, Jeffries, Davis, Chavis, Going, Bass, Harris, Brewer, Bunch, Griffin, Pettiford, Evans, and others in the 1760’s. Robert K. Thomas mistakenly calls Col. William Eaton “John Eaton”. 1. William Chavis Sr. (1706 – 1778). William was an original Granville County land owner and owned a substantial amount of land that would form the land base for the Native American community. 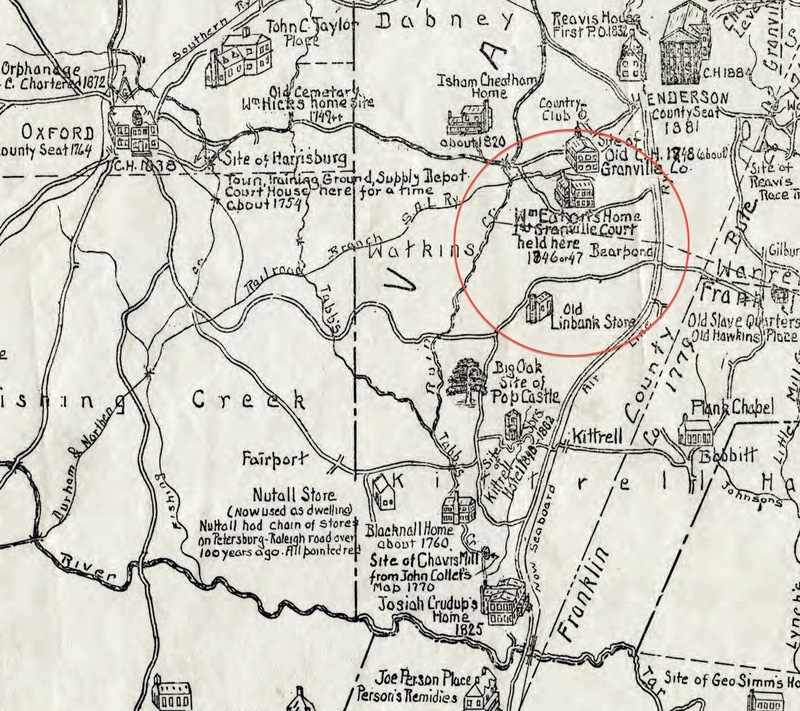 This land bordered Eaton’s as shown in the above map. 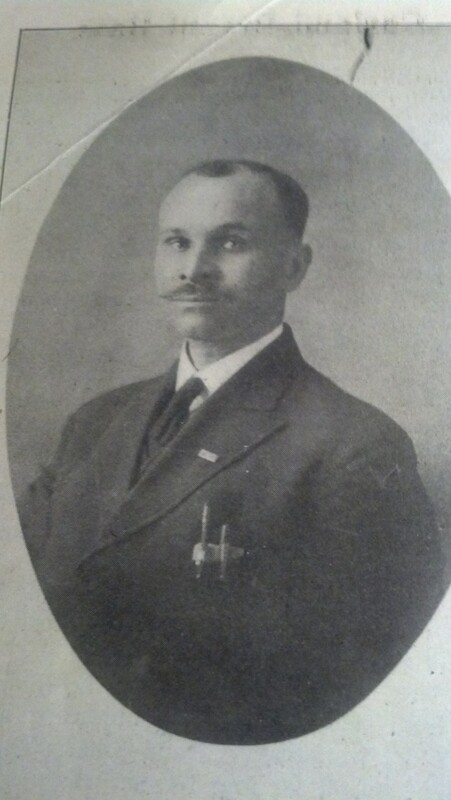 William Chavis also enlisted in Eaton’s regiment. (Note: William Chavis is my 7th great-grandfather). 2. William Chavis Jr (1741 – ?). 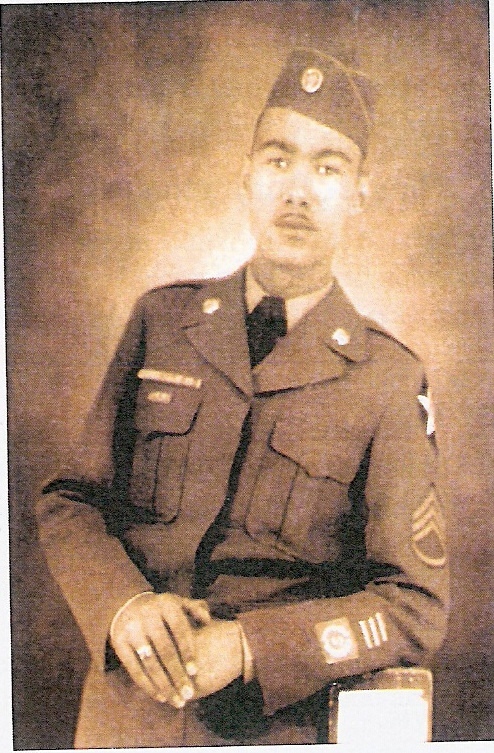 Son of William Chavis Sr and Frances Gibson. William Jr also served in Eaton’s regiment and inherited a parcel of his father’s land. 3. Gibson/Gilbert Chavis (1737-1777). 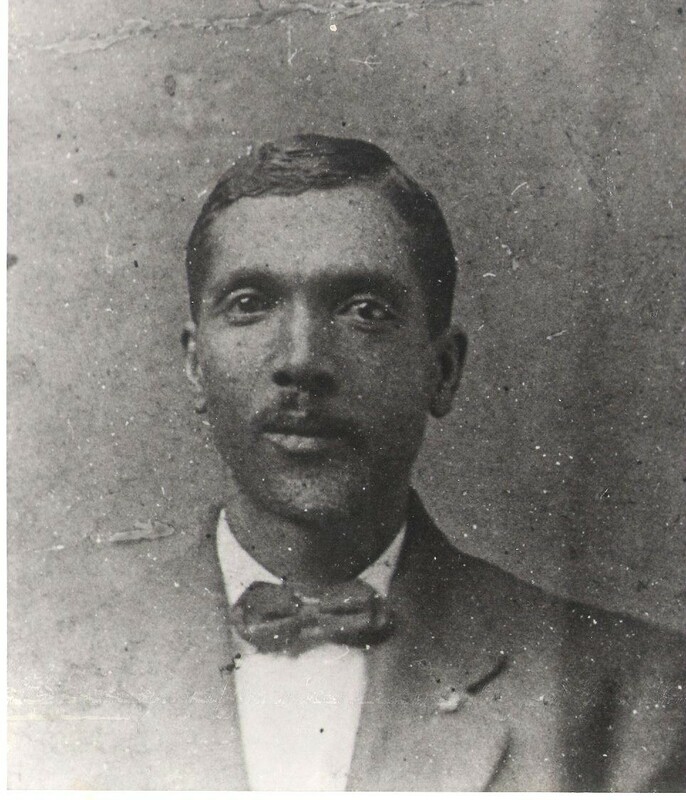 Son of William Chavis Sr. and Frances Gibson. Alternately called Gibson and Gilbert (and Gibeon) in the historical records, Gibson also enlisted in Eaton’s regiment and inherited a parcel of his father’s land. Gibson Chavis was the namesake of “Gibbs Creek” which runs off of the Tar River and was part of William Chavis Sr’s original tract of land. 4. Edward Harris (1730 – 1780s). Son-in-law of William Chavis Sr by marriage to his daughter Sarah Chavis. 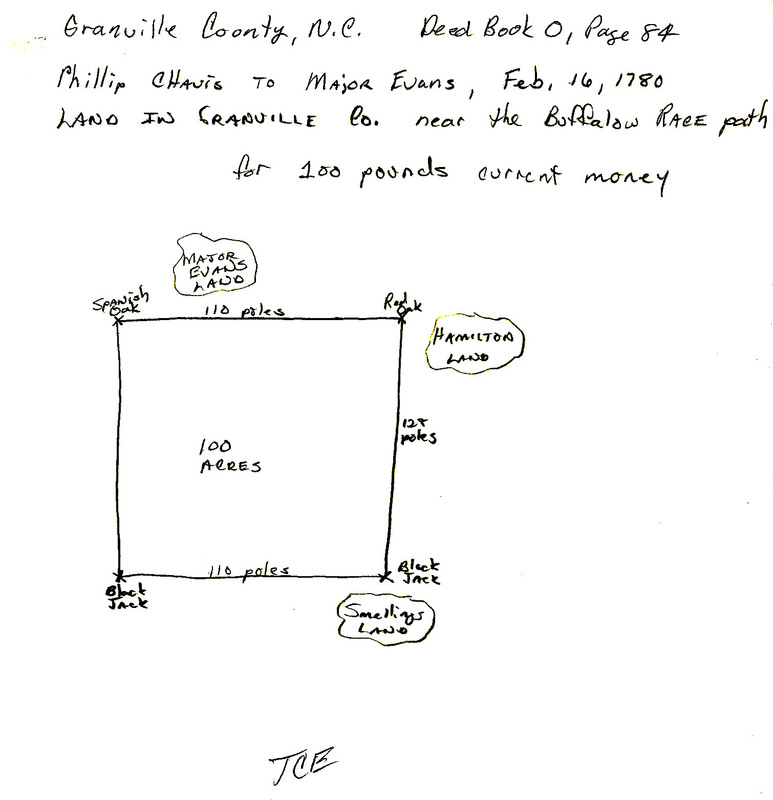 William Chavis gave his daughter Sarah Chavis-Harris a parcel of land that Edward Harris was subsequently taxed on. Edward also enlisted in Eaton’s regiment. 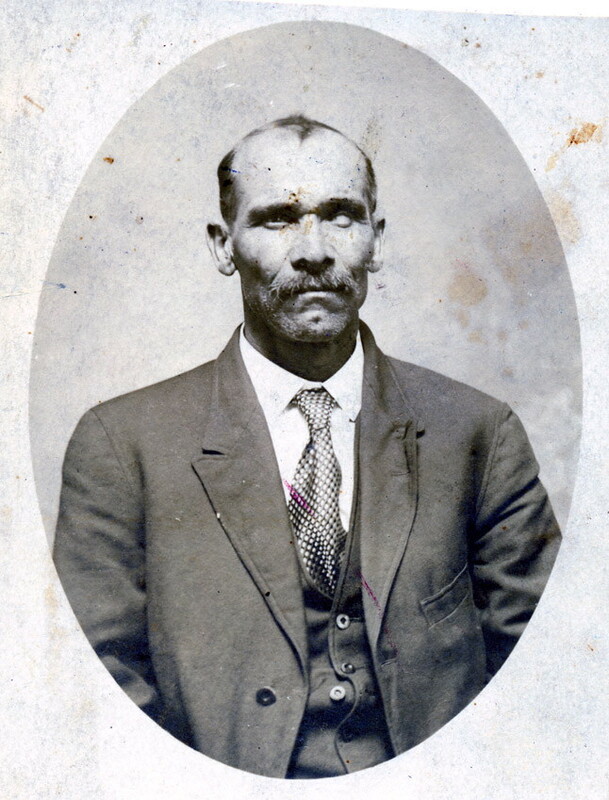 The Harris family from the state recognized Haliwa-Saponi tribe in Holliser, descend from Edward Harris. (Note: Edward Harris is my 6th great-grandfather). 5. Joseph Hawley (1725 – after 1791). Brother-in-law of Edward Harris by his marriage to Edward’s sister Martha Harris. Joseph’s land was adjacent to William Chavis’ and he first appears in the Granville County tax lists in 1750. Joseph also enlisted in Eaton’s regiment. The Holley/Hawley family of the state recognized Haliwa-Saponi tribe of Hollister, descend from Joseph Hawley. 6. William Bass (1712 – ?). William is documented in Granville County as early as 1749 and taxed in Granville throughout the 1750s and 1760s. He also enlisted in Eaton’s regiment. William is a documented great-grandson of John Bass(e) an English colonist and his Nansemond Indian wife Elizabeth. (There will be a blog post dedicated to the Nansemond descended Bass family who are one of the largest Native families in Granville). 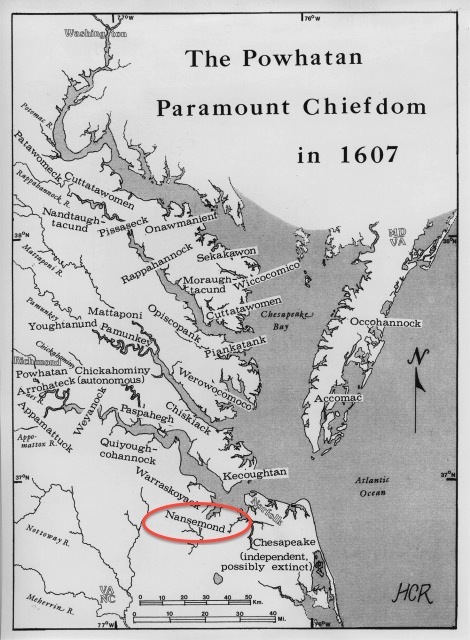 The Nansemond Basses who moved from the Tidewater area of Virginia into North Carolina, married into and became apart of local tribes including the Tuscarora and Saponi. 7. Lewis Anderson (1713-1785). Lewis was the brother-in-law of William Bass by his marriage to William’s sister Sarah Bass. Lewis first appears in Granville County records in 1749 and was counted in the tax lists until his death. He also enlisted in Eaton’s regiment. 8. George Anderson (1696-1771). George’s wife is unknown aside from her first name Mary. She could very well have been a member of the Bass family because the Bass and Andersons moved together from Norfolk, VA to Granville County by the mid 1700s. George is also a relative of Lewis Anderson. George first appears in the Granville records in 1746 and he enlisted in Eaton’s regiment. George’s mistress Lovey Bass with whom he fathered a child, was the sister of William Bass and the sister-in-law of Lewis Anderson. George’s daughter Catherine Anderson was a sister-in-law of Edward Harris through her marriage to Edward’s brother George Harris. 9. Lawrence Pettiford (1732 – after 1790) Lawrence first appears in the Granville records when he enlisted in Eaton’s regiment. He is also found consistently in the Granville tax records beginning in the 1750s. Lawrence’s wife was Mary but her maiden name is unknown. She was previously married to a member of the Mitchell family (a Native American/”free colored” family from Granville that did not enlist in Eaton’s regiment). Given the very close relationship between the Pettiford and Bass families who have been intermarrying for centuries, Mary may have been a Bass. 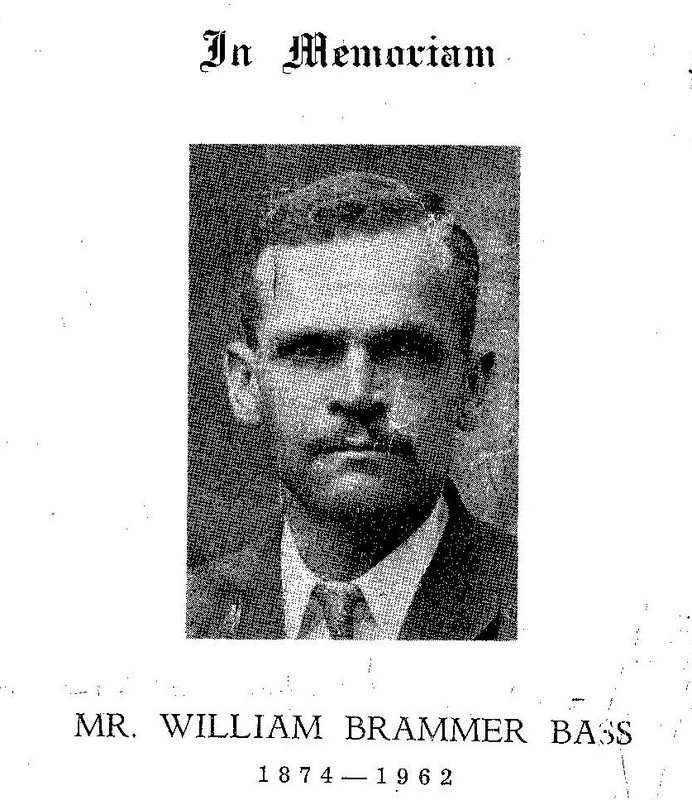 Lawrence also had a couple of land transactions with members of the Bass family, including Nathan Bass – son of the previously mentioned Lovey Bass and George Anderson. 10. George Pettiford (1736 – ?) George was a brother to Lawrence Pettiford. Like his brother Lawrence, George enlisted in Eaton’s regiment and is found in the tax record beginning in the 1750s. 11. Michael Gowen (1722 – ?) Michael enlisted in Eaton’s regiment and starts appearing in the Granville tax lists in 1750. He owned land off of Taylor’s Creek which falls within the original William Chavis land holding. Michael moved out of state to South Carolina towards the end of his life. 12. Edward Gowen (1727 – after 1810) Edward was a brother of Michael Gowen and also enlisted in Eaton’s regiment and appears in the tax lists beginning in the 1750s. Edward lived on Michael’s property off of Taylor’s Creek and remained in Granville County as did many of his children. 13. Thomas Gowen (1732 – 1797) Thomas was a cousin to Michael and Edward. He enlisted in Eaton’s regiment and was counted in the tax lists starting in the 1750s. Towards the end of his life, he and his children relocated to Montgomery Couty, NC. 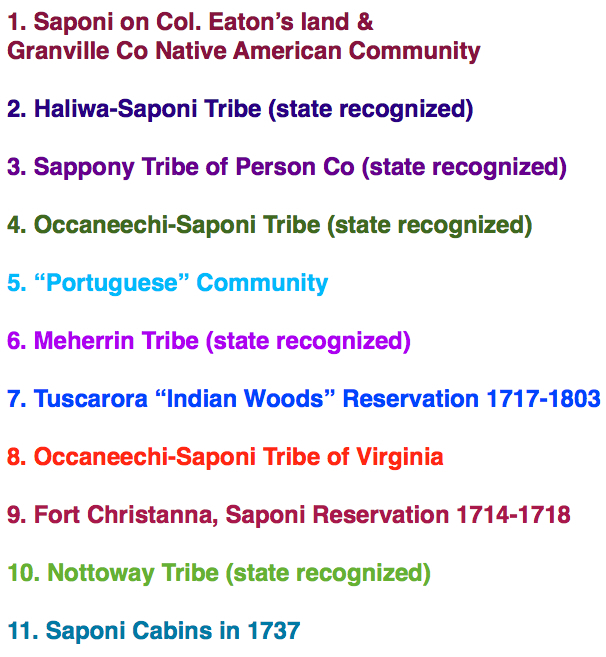 The above 13 men have the best documentation to show that they were part of the Saponi Indians living in Granville County. The following men were also most likely counted among the group of Saponi but I have some questions or need further documentation. 14. William Gowen (1710 – ?) William was a cousin to Edward, Michael, and Thomas Gowen. He enlisted in Eaton’s regiment and was in the tax lists beginning in the 1750s. Unlike his cousins, William was taxed as “white” in every Granville record and including his enlistment in Eaton’s regiment. Though Native Americans in the South were most commonly documented as “Free colored”, they were also occasionally documented as “white” (especially if there was a lot of recent mixed in European ancestry). However the fact that William consistently was recorded as white in Granville records, despite coming from a family that was not white, raises a lot of questions as to wether he was counted among the Saponi (who were clearly not being recorded as white at that time). William and his children relocated to South Carolina towards the later years of his life. 15. Robert Davis (1717 – ?). Robert first appears in the tax lists in the 1750s and enlisted in Eaton’s regiment. His wife is unknown. There were a couple more generations of Davises in Granville after Robert but the family was not large at all and did not leave many descendants. Because of this shortage of information along with no known parentage or siblings for Robert, I’m not sure if he was among the Saponi. 16. Lewis Pettiford (1734 – after 1794). Lewis was a brother to the already named George and Lawrence Pettiford, though unlike his brothers, he did not enlist in Eaton’s regiment. However he appears in the Granville tax lists beginning in 1758 – a couple of years after his brothers first appear in the tax lists. Perhaps this is why he did not enlist in Eaton’s regiment – he was not fully of adult age. His birth year is also an approximation and perhaps he was really a few years younger. 17. William Hawley (1728 – ?). William was a brother to the already named Joseph Hawley. He first appears in the Granville County tax lists in the 1750s but not consistently as it appears he relocated to South Carolina and then moved back and forth between the two locations. He also did not enlist in Eaton’s regiment. He was married to Amy Scott of South Carolina who was a relative of “King Hagler” of the Catawba Indians in South Carolina. The Saponi and Catawba are very closely related tribes, both part of the Eastern Siouan language group. 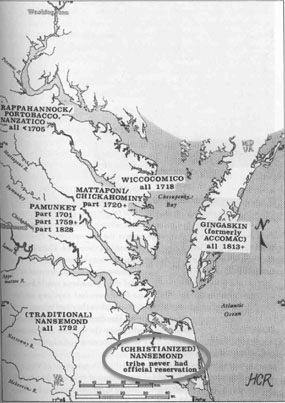 During the 1730s and 1740s, groups of Saponi sought refuge with the Catawba and then would return back to Saponi homelands. The back and forth movement of William Hawley along with family ties to the Catawba’s King Hagler, suggests that he was part of this movement of Saponi. 18. Gideon Bunch (1713 – ?). 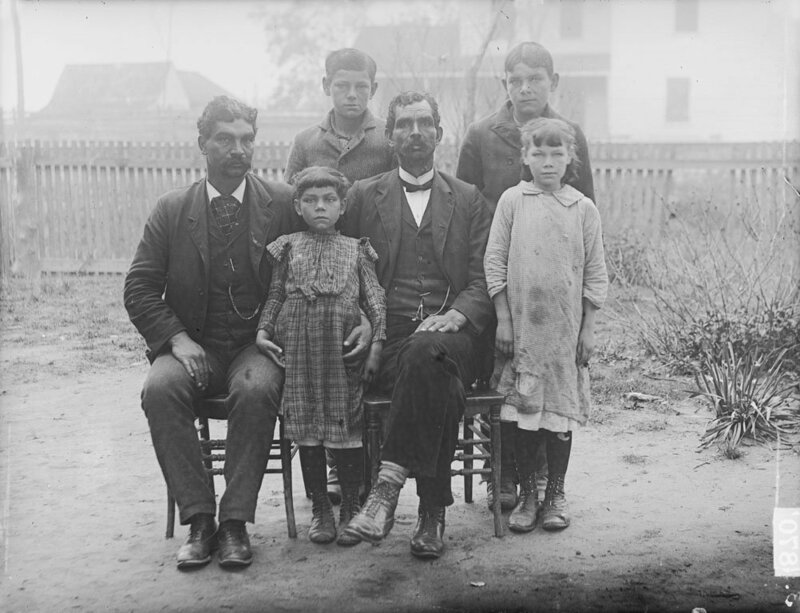 The Bunch family is a “free colored” family going back to the early 1600s in Virginia and have extensively married into many Native families. He inconsistently appears in the Granville County tax lists in the 1750s and 1760s and did not enlist in Eaton’s regiment. Tax and land records place him moving about in Virginia, North Carolina, and South Carolina. His later years were in South Carolina. 19. Richard Chavis (1724 – 1766) Richard was likely a brother of the previously named William Chavis Sr though I’d like to see additional records confirming their relationship. Richard is found in the tax lists beginning in the 1750s and in the 1760s. He did not enlist in Eaton’s regiment. Richard’s daughter Milly Chavis was married to Edward Silver. Interestingly, Edward purchased land from William Chavis Jr (part of the original William Chavis tract). Edward and Milly Silver are the progenitors of the Silver family found in the state recognized Haliwa-Saponi tribe in Hollister. So I counted 19 men, 13 of whom I’m confident identifying as the Saponi who lived next to and enlisted in Eaton’s regiment. According to the colonial records, there was anywhere from 14 – 20 Saponi men in Granville and the list that I created seems to fit that count. I would also venture to say that this was a conservative count and that there likely were more Native adult males in Granville County during this time. Furthermore, all of the men that I have identified are all very closely related by both blood and marriage, indicating a shared heritage and identity. These families would more or less remain in the same area and continue mostly intermarrying with one another well into the 20th century. These early settlers laid the foundation for my tribal community. Many of the sons of these founding members would take up arms with the colonists against the British in the uprising known as the American Revolution. 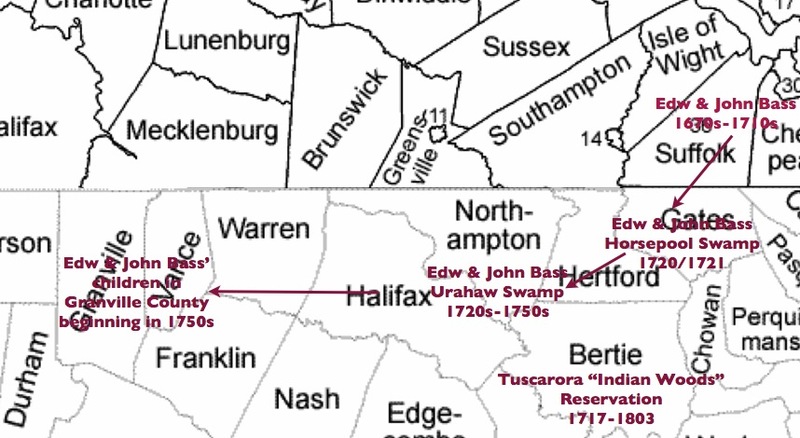 In the decades immediately preceding and following the Revolutionary War, additional Saponi as well as Tuscarora families with following surnames: Evans, Kersey, Brandon, Guy, Taborn, Tyler, Mitchell, Boon(e), Parker, Hedgepeth, Richardson, Howell, Scott and many more would join this settlement adding to the rich indigenous heritage of this community.